I have been seeing Jamberry nail wraps ALL over my Facebook for some time now. I had good intentions of giving them a try at some point but never got around to it. Enter my mommy-friend Chelsea! 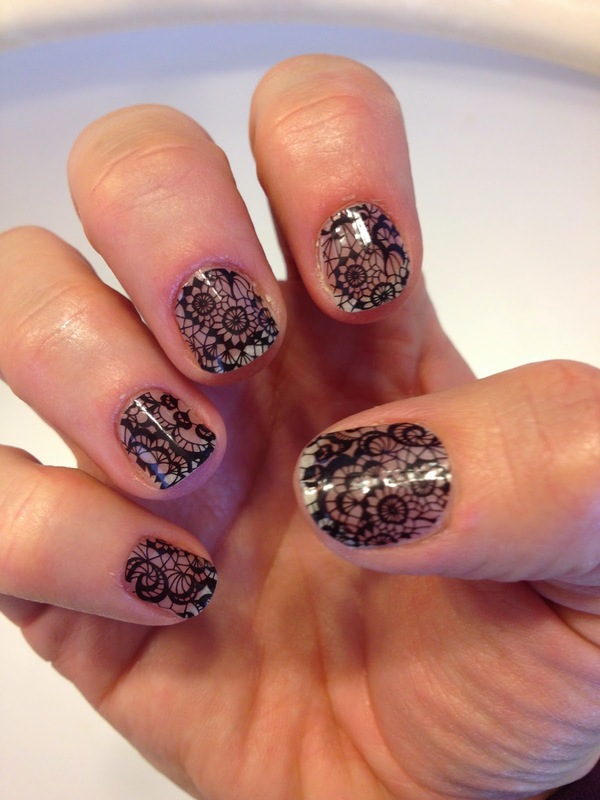 She's a fellow mom and blogger and she offered to let me try out the Jamberry wraps in exchange for a review - DEAL! I LOVE having pretty nails. I've gone through many nail phases including (but not limited to) acrylic/solar tips, home manicures, salon manicures, shellac manicures etc. Most recently, I've been getting shellac on my finger nails for special occasions (and when the mood strikes). I love how long shellac lasts but I'm not too keen on the cost OR what it does to my nails. It took a while for me to actually getting around to applying the wraps. I wanted to wait until I wasn't chasing a toddler... or working... or cooking or cleaning... you get the idea, it took a while. I also over estimated how long it would take me to apply them (I'm used to waiting for nail polish to dry). First, I dutifully watched the application videos. I tried to follow instructions as good as possible but in hindsight I probably rushed the application a little because I was so excited to see how it would turn out! I was immediately thrilled with the results. My nails looked so pretty but they usually do RIGHT after a mani. Today marks day 6 and I'm VERY impressed. I've read that people wear the Jamberry wraps for up to two weeks. I can see them lasting that long but I'm not sure I will be able to wait that long to try some new designs. Please tell me someone else is reminded of "the claw" from Liar Liar when looking at these pics. Anyone? Bueller? You can see that my nails are growing a bit, besides that, very little difference from day 1. I'm impressed because this is my first time applying them, I rushed a little, and I'm still going to get a solid week out of this manicure (I could get more, but I know I have more arriving soon lol). I've been so happy with the results, I've joined Chelsea's team and will be selling Jamberry as a fun hobby. For those who know me, I'm no salesperson, but when I find something I like, I like to share and I really like these nail wraps. So much so, it's been very challenging to pick only a few to try for now (there are over 300 different designs and I love the majority of them). I'm not going to beg you to order from me or join my team or anything like that. I DO want you to know I would NOT recommend these if I didn't love them AND I do want to share.... so, if you're interested in more info, see below, if not I dare you to look at the shop, see all the designs and not want to try them! If you're not interested in buying but want to support me by 'liking' my Facebook Page, I'd greatly appreciate it! If you'd like more info just comment below. If you'd like to order (it's always buy 3 sheets get 1 free!) then feel free to visit my page and order away. If you'd like to do the "7-day challenge" email at shaunacey@gmail.com with your address and I'll send you accent nails FREE so you can see how long the jamberry nail wraps last compared to regular polish. If you're interested in joining my team email me! stay tuned for some SUPER cute manis and pedis! it should work, I can sell to people in the US because they ship directly to you! I just can't host parties for US residents. Those sound great! Nail polish never lasts on real nails, so to have something that lasts 2 weeks would be awesome! I might have to check them out. You should, I'm loving them! Hey cutie! I first saw these through one of our challenge buddies (but I can't remember who!). They look just precious on you. Do you wear them over polish or instead of polish? How difficult are they to put on? I have two left hands when it comes to using a curling wand, styling my hair, doing my nails and two left feet when it comes to anything athletic like walking or dancing! Hi Leslie, I just used them on my bare nails. I have read that people put them over nail polish but I haven't tried that yet. I found them fairly easy to put on - I got both hands done within 30min. There are application videos which are VERY helpful. I'm fairly clumsy too (and uncoordinated) but still managed to get them on... I'm also hoping that the more I apply them the better I'll get! My mani's never last more that a few days so I'd love to have my nails looking good for more than a week! How hard is it to get the wraps on? Jamberry is the BEST! I'v got my jamicures down to 10 minutes - you just can't beat the convenience and cuteness! Plus, wearing them helped my nails grow out - win-win! 10 minutes is impressive!!! might need to give me some tips! You did a really good job with applying them, I always worry I would mess it up. It seems Jamberry nails are all the rage lately. And, they last for 2 weeks? Wow! That is pretty impressive. I am going to need to check them out sometime, I will keep you in mind for when I am ready! lol! I'm excited for my stuff to arrive because I want new ones! I love the pattern you chose! I've seen quite a few reviews but I haven't given them a go yet either. I'd love to though and of course now I'm out of the country lol! 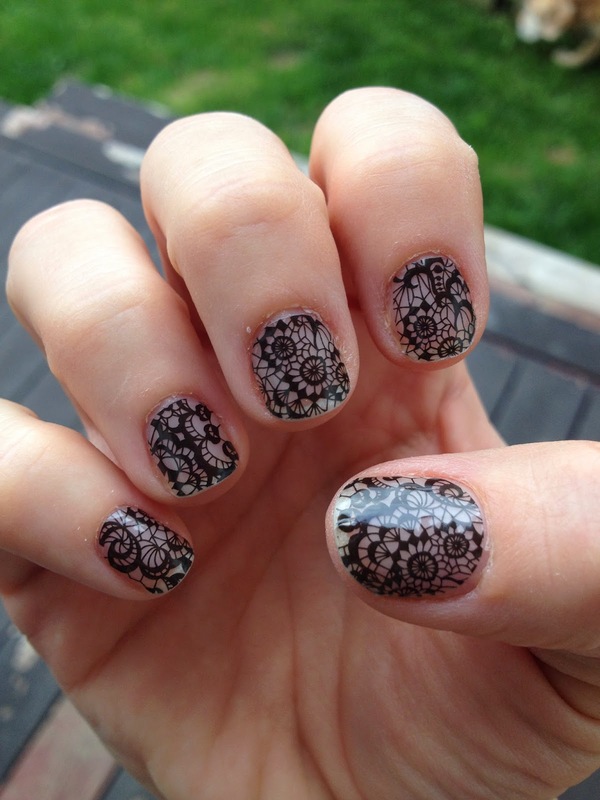 Shaunacey, I will definitely try Jamberry nail wraps. I'd heard of it but never really what it was. I don't do a lot with my nails other than keep them short and paint them a solid color, so this looks pretty fun to try. Thank you for sharing!